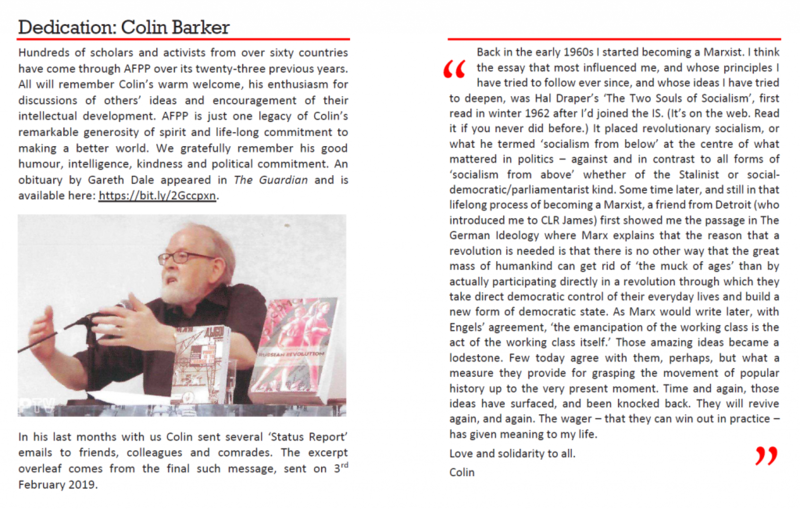 Livestream: Colin Barker – A celebration of his work. A key event in the programme for Alternative Futures and Popular Protest is a retrospective on the work of Colin Barker, co-founder of AFPP. This will be a roundtable format, with contributions from Ian Allinson, Laurence Cox, Gareth Dale, John Krinsky, Madelaine Moore, Trevor Ngwane and Mike Tyldesley. Use the link above if you wish to follow the livestream. You might also be interested in the following page from the conference programme (click to enlarge).